For a first issue, this opening shot of the War of the Supermen crossover takes a whole lot for granted. Wasting no time on setup or back story, today's installment throws Kal and family right into the fray, firing the gun to begin the race before some readers will have even reached their starting blocks. That gave me the impression that I was always playing catch-up, often a page or two behind the story's fast pace, and it's a situation that writers Sterling Gates and James Robinson take full advantage of on several occasions. I've never been a dedicated reader of the Superman family of titles, so a lot of the finer points of this issue were probably lost on me, but I could still glean enough scraps of information from the scenery to get a pretty good picture of what's going on. Clearly Gates and Robinson didn't compose this story with irregular readers such as myself in mind, as they've been building to it since the beginning of their respective runs with the characters nearly two years ago. Despite missing some of its finer points, though, the broader picture of this issue (and the impact of its big surprise around the halfway point) was never in question. The two writers do spend an awful lot of time and effort on long, dry collections of word balloons – so much that I was gearing up to bear another issue-wide storm of such material – but in this case that worked to a greater good. The excess of dialog elsewhere in the book only heightens the shock and awe inspired by the handful of wordless reaction pages surrounding the big reveal. Jamal Igle's artwork fares particularly well on such pages. His more straight-laced, Gary Frank-inspired style does endure a few ups and downs throughout the story, but it enjoys a well-timed peak during the pages in which it's most desperately needed. In Igle's hands, Superman himself doesn't quite feel larger than life, which is both a blessing and a curse. We're missing that one iconic panel to take our breath away and command our respect, but the lack thereof makes Big Blue a more approachable character. That's vital when a certain climactic event results in a more human look from the story's centerpiece than we usually get to enjoy. On a few occasions, Igle oversteps his bounds and overcomplicates a scene with extra details, but when he keeps restraint in mind, his work is a natural fit. As I mentioned above, a good deal of the lead-in work for this series had already been done before the arrival of this issue. That doesn't make it any less of an introductory chapter. 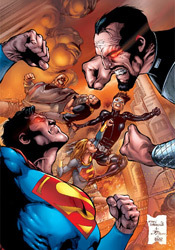 No, it's actually quite the opposite: without so many minor details in its way, War of the Supermen #1 can cut to the quick and concentrate on introducing the impetus behind the three issues soon to follow. Some of the preliminary work may have already been done, but this is still very much an opening volley. And it's a very good one if not a great one. Borrow it. The stage is set for big things down the road in this series, but I wish I had more confidence that it's going to realize that potential.